Today, nine weeks before Easter, is traditionally Septuagesima Sunday, the beginning of a period of preparation for Lent. 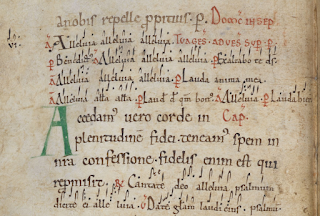 One of its most distinctive features was the custom of ceasing to sing 'Alleluia' at mass, a practice referred to in medieval England as 'locking the Alleluia'. The word was symbolically locked away, to be unlocked again amid the celebration of Easter - then the word was imagined to be released from its captivity, just as Christ would break out of the tomb and human beings would be liberated from captivity to their sins. We willað eow secgan be ðyssere andweardan tide, hwi seo halige gelaðung forlæt on Godes cyrcan ‘Alleluian’ and ‘Gloria in excelsis Deo’, fram ðisum andwerdum dæge oð þa halgan Eastertide. Sum wis lareow hatte Amalarius, se awrat ane boc be cyrclicum ðeawum, hwæt ða gesetnyssa Godes þenunga of gearlicum ymbryne getacniað, and cwæð be ðyssere andwerdan tide, þe is gecweden Septuagesima, þæt heo gefylð ða getacnunge þæra hundseofontig geara þe Israhela folc on hæftnede Babiloniscum cyninge þeowde. Septuagesima is hundseofontigfeald getel. 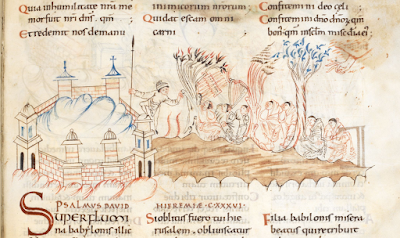 Seo tid onginð on ðisum Sunnandæge, nigon wucon ær Eastron, and geendað on ðam Saternesdæge þære Easterlican wucan: to ðam daæge sind heonon getealde hundseofontig daga; and þæt Israhela folc, for heora mandædum and forgægednyssum, wurdon gehergode, and hundseofontig geara on Babiloniscum þeowdome, buton blisse and myrhðe, wunodon. Nu hylt Godes gelaðung þis hundseofontigfealde getel sylfwilles for hire gyltum, swa swa se ealda Israhel neadunge heold on hæftnunge, oðþæt se mildheorta God eft, æfter heora gedrefednyssum, hi ahredde, and to heora earde gelædde. Witodlice ðas dægðerlican ðenunga cyðað þæt fram ðisum dæge oð Eastron is ure heofungtid and bereowsungtid ure synna mid sumere stiðnysse. 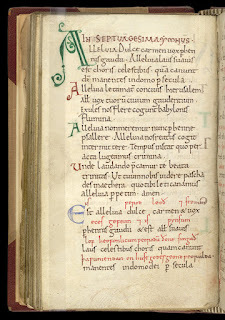 ‘Alleluia’ is Ebreisc word, þæt is on Leden ‘Laudate Dominum,’ and nan gereord nis swa healic swa Ebreisc. 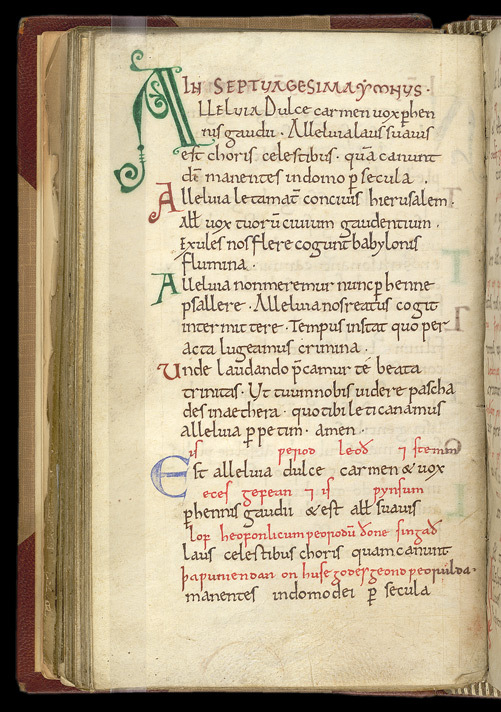 Nu forlæte we þæt healice gereord on ure Septuagesima, and cweðað on Leden, ‘Laus tibi, Domine, Rex aeterne gloriae’; þæt is, ‘Sy ðe, Drihten, lof, eces wuldres Cyning.’ We geswuteliað mid þære eadmodan Leden spræce, þæt we sceolon us sylfe to eadmodran drohtnunge on ðyssere tide gebigan. ‘Alleluia’ is, swa we cwædon, heofonlic sang, swa swa Iohannes se apostol cwæð, þæt he gehyrde micele stemne on heofonum, swylce bymena dream, and hi sungon ‘Alleluian.’ ‘Gloria in excelsis Deo’ sungon englas, þaþa Crist on middanearde lichamlice acenned wæs. 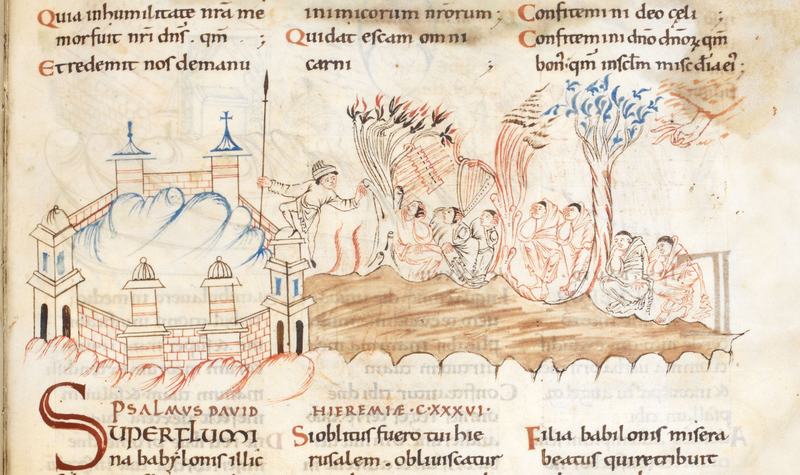 Nu forlæte we ðas heofonlican lofsangas on ure bereowsung-tide, and we biddað mid soðre eadmodnysse ðone Ælmihtigan, þæt we moton geseon his heofenlican Easter-tide, æfter þam gemænelicum æriste, on ðam we him singað ecelice Alleluian butan geswince. Amen. 'We wish to speak to you about this present season, why the holy congregation in God’s church omits ‘Alleluia’ and ‘Gloria in excelsis Deo’, from this present day until the holy season of Easter. There was a wise teacher named Amalarius, who wrote a book about the church’s customs and what the ceremonies of God’s servants symbolise through the course of the year; and he said about this present season, which is called Septuagesima, that it acts as a token of the seventy years for which the people of Israel served the king of Babylon in captivity. Septuagesima is the number 'seventy'. The season begins on this Sunday, nine weeks before Easter, and ends on the Saturday in Easter week; from now until that day are counted seventy days, and the people of Israel, for their sins and transgressions, were taken into captivity and lived for seventy years in slavery to Babylon, without joy and bliss. Now God’s church keeps this period of seventy, by choice, for their sins, just as Israel of old was forced to keep it in captivity, until merciful God rescued them after their tribulations and led them to their homeland. mourning exiles now are we. when our tears for sin must flow. Septuagesima is not widely observed today, and the opportunities to sing this ancient hymn are therefore few. Hymns about hymn-singing are always interesting to me; the idea of singing together is a powerful image of unity, and in this case the practice of singing - and ceasing to sing - in concert with the Israelites is, as Ælfric explains, an important symbol of how the medieval church saw its relationship with its Jewish heritage. The practice of 'locking' the alleluia is a liturgical re-imagining of one of the most poignant laments in human history, a despairing question which for thousands of years has given voice to many different political and personal situations of loss, exile, and dispossession: 'how can we sing the Lord's song in a strange land?' For the medieval church, this question was interpreted as the cry of a universal experience of estrangement: all human beings are in exile and captivity on earth, longing for their home in heaven, and every year through Lent and Easter the church re-enacts its longed-for progression from exile to homecoming, from grief to joy. 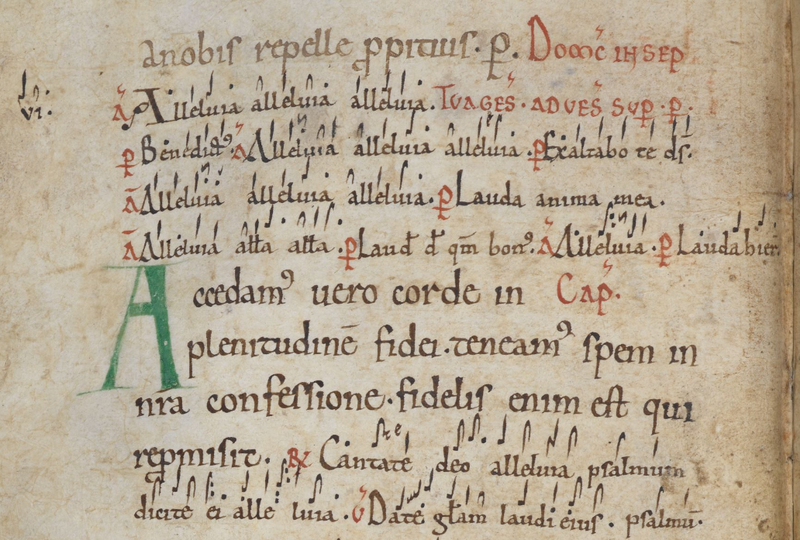 Today is one of those occasions on which the modern church has chosen not to sing in harmony with its medieval forebears, but if you would like to make an exception, you can find the tune to 'Alleluia dulce carmen' here. My COD tells me 'hosanna' comes from 'hosha'na' for hoshi'ahnna', 'save, pray!' - about which I once heard in a Palm Sunday sermon by Bishop Geoffrey Rowell. Was there an Old English awareness of this, and attention to its meaning in connexion with why there was no 'locking the hosanna'? Very interesting question! Yes, there was an awareness of the meaning - in Old English it's usually translated by an exclamation like 'sy hæl', literally 'be saved' (as in the greeting 'hail!'). It usually appears in the context of Palm Sunday homilies or English translations of the Gospel accounts of the entry into Jerusalem. Thank you for this! Septuagesima is restored (though not yet it's proper lections) in the calendar of the Personal Ordinariates.